In many countries, single-family homes (SFH) constitute the majority of residential buildings. In Germany 66 % of the residential building stock is made up by SFH. SFH are traditionally in great demand, and in 2011, more than 50 % of the population in Europe lived in SFH. "Detached houses" constitute about 60 % of the housing units in Japan as well as in the USA. For some time already, increasing indications can be found, that this segment of the housing stock is under pressure. Economic and financial crises, demographic and social structural change, and changes in user preferences, are raising new challenges to it. Outside core regions of economic growth, stagnating or dropping prices, difficulties in selling, and even vacancies, are no longer a rarity in this segment in many regions. Nonetheless, these developments, and the possible consequences connected with them, have hardly been investigated from a number of relevant perspectives, including economics (e. g. loss of equity/capital, ecology (e. g. inefficiencies in terms of energy, land and material use), settlement-structure or the social situation (e. g. down-trading of neighbourhoods). While multifamily residential buildings enjoy a high level of attention from residential policy-makers and the housing industry, the developments in the area of the SFH segment, with its small scale private ownership structures – approximately 90 % of these buildings are user-owned – is neither on the academic nor on the political agenda. 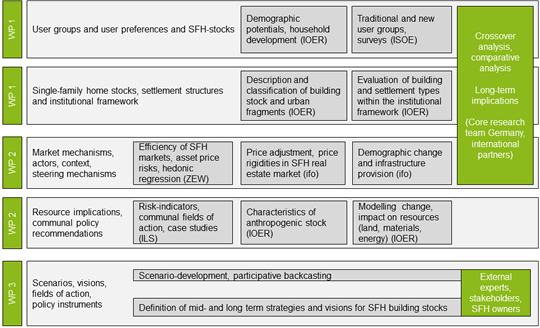 Against this background the overarching research questions of the project are as follows: What are the effects of ongoing demographic, sociocultural and structural changes on the utilization of SFH building stocks in Germany and other industrialized countries? Which resulting economic, ecological, urban-structural and social challenges can be identified and how can they be approached and solved by society and policy alike? The project seeks to scrutinize these issues out of an interdisciplinary perspective. The investigations on the situation in Germany will be supplemented by comparative studies inside Europe, as well as on the situation in Japan and the United States. The international perspective is underpinned by several international cooperating partners and an international advisory board. International workshops and conferences will furthermore help to establish a network to reach beyond the immediate project team.